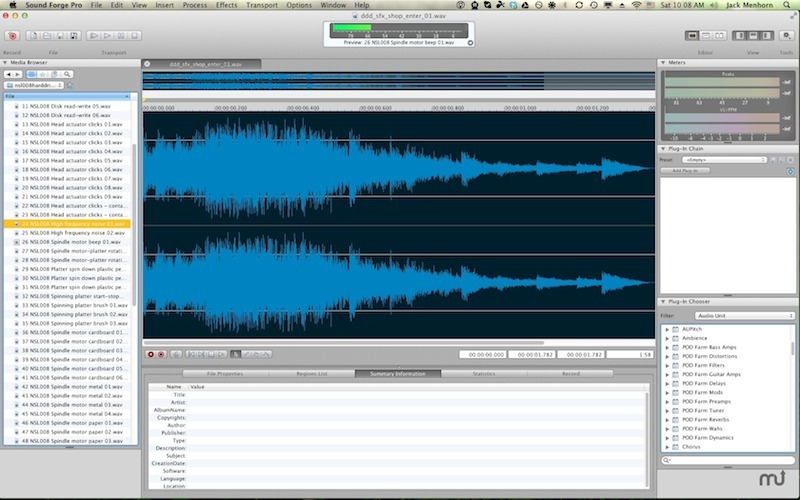 Sound Forge Pro 1.0.26 – Record, edit, process, and render broadcast-quality audio. Built on a clean slate for OS X, Sound Forge Proprovides a contemporary application environment that’s perfect for recording, editing, processing, and rendering broadcast-quality audio master files. A fresh statement on audio editing software, Sound Forge Pro Mac includes a comprehensive suite of mastering, restoration, and repair tools for immediate results. Finally on the Mac, an audio editing application designed exclusively for OS X with a workflow that can keep up with your creative flow. Configurable viewing panels allow you to toggle to any project view you need in seconds – see everything at once or toggle your view to see only the features you want, when you want. Easily navigate the entire interface and work quickly, even on laptops. Assigning hardware, metering input signals, arming tracks, and recording high-resolution multichannel audio is a simple and fluid process in Sound Forge Pro Mac. Route your inputs, position the Record tool anywhere in the user interface, click Record, and bring pristine audio into your computer – up to 32 simultaneous channels at 64-bit/192 kHz resolution. Enjoy a full range of native processes including fade, flip, mute, normalize, and reverse. Process audio using repair tools from iZotope, and time/pitch modification algorithms from Zplane™. Easily access your plug-in collection for offline and nondestructive processing. Enjoy instant access to everything you need to prepare, process, and render finished audio master files. Sound Forge Pro Mac includes iZotope’s Mastering and Repair Suite of high-end processing plug-ins that you can use right away by simply dropping them into the application’s Plug-In Chain tool. Fixed a bug that prevented OS X 10.9 from displaying VST plug-ins. Fixed a bug that caused Simple Synthesis to report its progress incorrectly. Next story Navicat Premium 11.0.15 – Combines all Navicat versions in an ultimate version. Previous story Sign PDF 2.1.0 – Sign PDF’s electronically. AlbumStomp 1.1.3 – a powerful album design app. mocha Pro 4.1.2 – a stand alone software utility optimized for visual effects and post-production challenges.